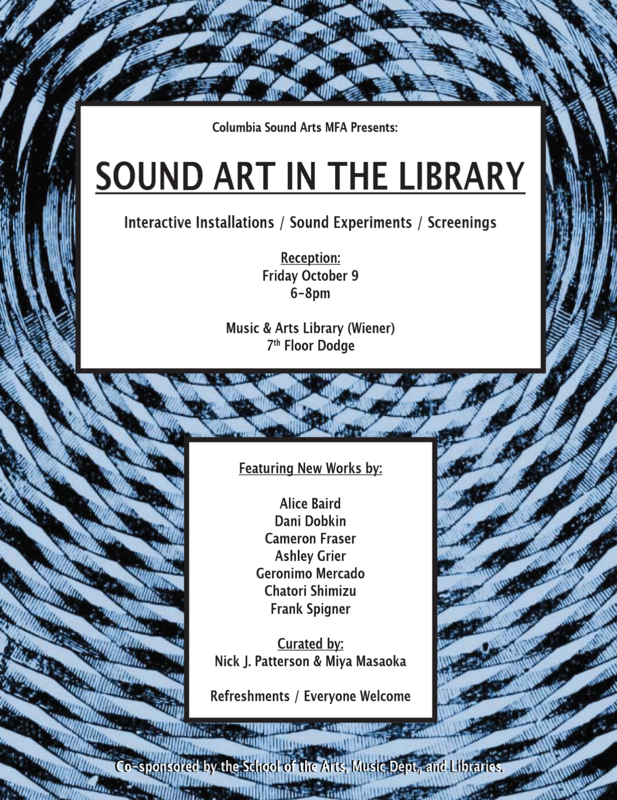 You are cordially invited to a reception celebrating the opening of the exhibition “Sound Art in the Library”, on Friday Oct 9, 6-8pm, in the Music & Arts Library, 701 Dodge. New works by Sound Arts MFA students Alice Baird, Dani Dobkin, Cameron Fraser, Ashley Grier, Geronimo Mercado, Chatori Shimizu, and Frank Springer will be featured, and will include interactive installations, screenings, and sound experiments. 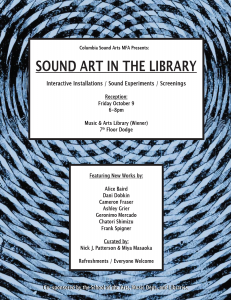 Click here for the full event flyer in PDF format: FLYER_Library_Sound. Light refreshments will be served. This event is co-sponsored by the Music Dept., School of the Arts, and Columbia University Libraries. This entry was posted in Uncategorized on October 8, 2015 by Nick Patterson.